NGSquant™ Library qPCR Kit for Illumina® New! Morquecho-León, MA., et al (2013) Isoforms of protein kinase C involved in phorbol ester-induced sphingosine 1-phosphate receptor 1 phosphorylation and desensitization. Biochimica et Biophysica Acta (BBA) – Molecular Cell Research, Volume 1843, Issue 2, February 2014, Pages 327–334. [shRNA plasmid]. Zhou, Y., et al (2013) miR-203 induces oxaliplatin resistance in colorectal cancer cells by negatively regulating ATM kinase. Molecular Oncology, Available online 8 October 2013. [shRNA plasmid, Lentiviral miR-203 and miR-203 expression inhibitor constructs]. Wang, WS., et al (2013) DMOG Ameliorates IFN-γ-Induced Intestinal Barrier Dysfunction by Suppressing PHD2-Dependent HIF-1α Degradation. Journal of Interferon & Cytokine Research, Volume: 34 Issue 1: January 9, 2014. [shRNA]. Dai, Y., et al (2013) Characterization of the oncogenic function of centromere protein F in hepatocellular carcinoma. Biochemical and Biophysical Research Communications, Volume 436, Issue 4, 12 July 2013, Pages 711–718. 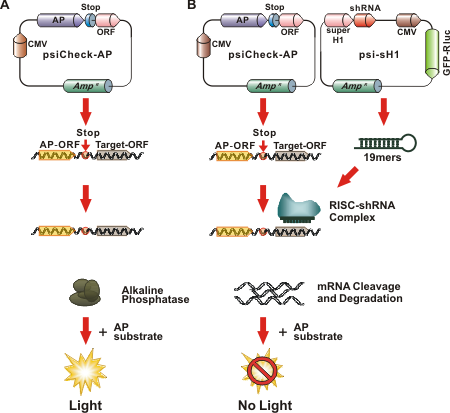 [shRNA plasmid]. Cahill, ME., et al (2013) Neuregulin1 signaling promotes dendritic spine growth through kalirin. Journal of Neurochemistry, Volume 126, Issue 5, pages 625–635, September 2013. [ErbB4 shRNA and a scrambled control]. Yu, F., et al (2013) Deficiency of Kruppel‐like factor KLF4 in mammary tumor cells inhibits tumor growth and pulmonary metastasis and is accompanied by compromised recruitment of International Journal of Cancer, Volume 133, Issue 12, pages 2872–2883, 15 December 2013. [shRNA]. Popovics, P., et al (2013) Phospholipase C‐η2 is required for retinoic acid‐stimulated neurite growth. Journal of Neurochemistry, Volume 124, Issue 5, pages 632–644, March 2013. [PLCη2-targeted]. Roff, A.N., et al (2013) Post-transcriptional Regulation of Meprin α by the RNA-binding Proteins Hu Antigen R (HuR) and Tristetraprolin (TTP). Journal of Biological Chemistry, 288, 4733-4743. [TTP, HuR, or negative control shRNA constructs]. Ku, M.C., et al (2013) GDNF mediates glioblastoma-induced microglia attraction but not astrogliosis. Acta neuropathologica, (2013): 1-12. [GDNF OmicsLink™ short hairpin RNA (shRNA)]. Xie, L., et al (2013) RalA GTPase Tethers Insulin Granules to L‐and R‐Type Calcium Channels Through Binding α2δ‐1 Subunit. Traffic, Volume 14, Issue 4, pages 428–439, April 2013. [Ca v α 2 δ-1]. Aikawa, M., et al (2013) NOTCH INHIBITION IN THE TREATMENT AND PREVENTION OF A METABOLIC DISEASE OR DISORDER AND CARDIOVASCULAR COMPLICATIONS THEREOF. U.S. Patent No. 20,130,064,832. 14 Mar. 2013. [mouse Dll4]. Kim, S.J., et al (2013) Regulation of dendritic cell activation by microRNA let-7c and BLIMP1. Journal of Clinical Investigation, 2013 February 1; 123(2): 823–833. [mouse Blimp1, lentivirus vector]. Zhu, S., et al (2013) Regulation of CXCR4-mediated invasion by DARPP-32 in gastric cancer cells. Molecular Cancer Research 11.1 (2013): 86-94. 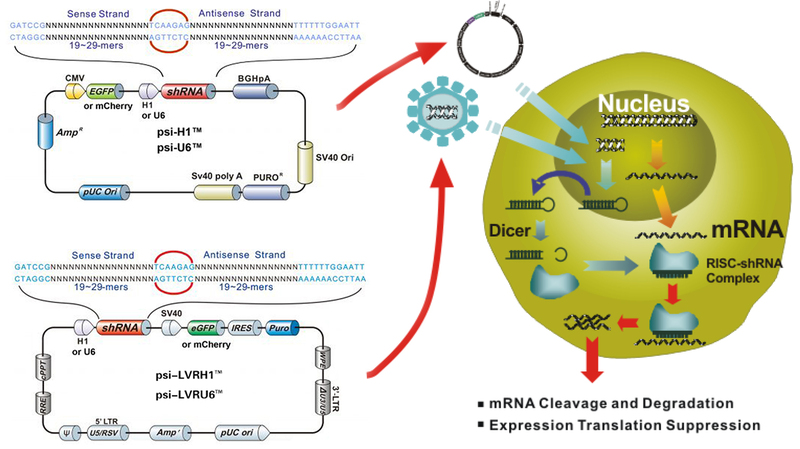 [Lentivirus expressing DARPP-32, short hairpin RNA (shRNA)-DARPP-32, or control shRNA]. Siouda, M., et al. (2012) Transcriptional Regulation of the Human Tumor Suppressor DOK1 by E2F1. Molecular and Cellular Biology, December 2012 vol. 32 no. 23 4877-4890. [DOK1-shRNA in psiHIV-H1 vector]. Grespi, F., et al. (2012) P73 and age-related diseases: is there any link with Parkinson. Aging, Volume 4, N 12. [exon 13 shRNA]. Chen, X., et al. (2012) Analysis of Substrates of Protein Kinase C Isoforms in Human Breast Cells By The Traceable Kinase Method. Biochemistry, 2012, 51 (36), pp 7087–7097. Song, J., et al. (2012). Tumour-derived IL-10 within tumour microenvironment represses the antitumour immunity of Socs1-silenced and sustained antigen expressing DCs. European Journal of Cancer, Volume 48, Issue 14, September 2012, Pages 2252–2259. [pEZX-IL-10-shRNA]. Lundh, M., et al. (2012) Histone deacetylases 1 and 3 but not 2 mediate cytokine-induced beta cell apoptosis in INS-1 cells and dispersed primary islets from rats and are differentially regulated in the islets of type 1 diabetic children. Diabetologia, Volume 55, Number 9 (2012), 2421-2431, DOI: 10.1007/s00125-012-2615-0. [HDAC2, HDAC3]. Kim, J., et al. (2012) GLTSCR2 contributes to the death resistance and invasiveness of hypoxia-selected cancer cells. FEBS Letters, Volume 586, Issue 19, 21 September 2012, Pages 3435–3440. [GLTSCR2]. Leone, V., et al. (2012) Thyrotropin Regulates Thyroid Cell Proliferation by Up-Regulating miR-23b and miR-29b that Target SMAD3. The Journal of Clinical Endocrinology & Metabolism September 1, 2012 vol. 97 no. 9 3292-3301. [rat CREB1]. Belkhiri, A., et al. (2012) Resistance to TRAIL is mediated by DARPP-32 in gastric cancer. Clin Cancer Res July 15, 2012 18; 3889. [DARPP-32]. Ridgway, L., et al. (2012) Heparanase-induced GEF-H1 signaling regulates the cytoskeletal dynamics of brain metastatic breast cancer cells. Mol Cancer Res June 2012 10; 689. [GEF-H1]. Peng, D., et al. (2012) Glutathione peroxidase 7 protects against oxidative DNA damage in oesophagealcells. Gut 2012;61:1250-1260 DOI:10.1136/gutjnl-2011-301078. [GPX7 shRNA lentiviral particles]. Wade, A., et al. (2012) Activated Leukocyte Cell Adhesion Molecule (Alcam) Modulates NeurotrophinSignaling. Journal of Neurochemistry Volume 121, Issue 4, pages 575–586, May 2012. [shRNA ALCAM]. Zhang, M., et al. (2012) Autophagy and Apoptosis Act as Partners to Induce Germ Cell Death after Heat Stress in Mice. PLoS ONE 7(7): e41412. DOI:10.1371/journal.pone.0041412. [Mouse Atg7]. Pérez-Gómez, E., et al. (2012) The orphan receptor GPR55 drives skin carcinogenesis and is upregulated in human squamous cell carcinomas. Oncogene , (2 July 2012) | DOI:10.1038/onc.2012.278. [GPR55 (psi-U6-EGFP)]. Jerebtsova, M., et al. (2012) HIV-1 Resistant CDK2-Knockdown Macrophage-Like Cells Generated from 293T Cell-Derived Human Induced Pluripotent Stem Cells. Biology 2012, 1(2), 175-195; DOI:10.3390/biology1020175. [CDK2]. Lee, S., et al. (2012) Nucleolar protein GLTSCR2 stabilizes p53 in response to ribosomal stresses. Cell Death and Differentiation (2012) 19, 1613–1622; DOI:10.1038/cdd.2012.40; published online 20 April 2012. [Lentivector-based shRNA system]. This entry was posted in 产品, 克隆库, 技术 and tagged shRNA克隆. Bookmark the permalink.